Some might argue that the clue’s in the name, and they’d be right. However, every seasoned theatre-goer knows that some of the shows on in this little, brightly-coloured district can be prohibitively expensive. If you do want to get to a show, we recommend booking well in advance (most shows sell out most nights in this area) and filling every night with something spectacular. Rather than choose from one of the hundreds of long-running plays in the area (that would be too predictable), we thought we’d be a little different, however it is related. Get yourself to the Phoenix Theatre, but don’t book to see a show there. Instead, take the left turn just before the theatre on the southern side of the building and go downstairs into the Phoenix Arts Club. This is a member’s bar but they’re usually very good about offering a one-time temporary membership. Here you can rub shoulders with the biggest and brightest of London’s theatre industry and enjoy the operatic, eclectic and deeply theatrical décor and atmosphere of one of London’s favourite (and least known) theatre bars. Of course, if you’re going to Theatreland then the likelihood is that you’re going to see a play there. Some change regularly, and it’s definitely important to see what’s new (rather than the staples that hang around for years). Some are popular for no other reason than they’re biopics of famous bands but in actuality are a bit naff, but some are famous because they are indeed excellent. Recommendations on this front have to include the Woman in Black, The Mousetrap (the longest running play ever in history!) and Spamalot. You’re also in the thick of Soho and Charing Cross, which has the delights of Chinatown and all of the associated things to do: jazz bars, nightclubs, pokey little restaurants and cafés, dim sum joints and so on; so any amount of time spent here can be nothing but time well spent. Whether you just want to walk around amongst the glitz and glamour of the world’s most famous theatre district or you have a huge itinerary of theatre booked, you won’t be short of things to do in this area. And as it really comes to life after dark and is open late, all the more reason to book a comfortable bed to collapse into at the end of it all. Check out our Theatreland hotel booking service to see what great deals are on offer now! Theatre Royal Drury Lane is one of Theatreland’s most significant and important theatres. Opened in the late 17th Century to the design of Christopher Wren, the theatre is a beautiful building and one that is steeped in heritage and history. A really large venue with over 2,000 seats, Theatre Royal Drury Lane recently began running the famous musical, Oliver! Drury Lane is one of the most famous roads in Theatreland, famous for its historical links to London theatre. You’ll find the Theatre Royal and New London Theatre on this road. There are so many theatres to choose from in Theatreland, and a popular choice is the Lyceum Theatre. Come here with or without kids to enjoy The Lion King. Covent Garden is located in the east of Theatreland and - along with the theatres and a number of great shops, bars and restaurants - there are several interesting attractions. Whilst you enjoying a stroll around Covent Garden you could visit Covent Garden Piazza, the London Transport Museum and the Covent Garden Comedy Club. It’s not just theatres that you can visit in Theatreland, you can also enjoy arts and music. One of the most famous venues in the area is the Royal Opera House. Come to this historic opera house to experience the very best in opera and ballet. Slap bang in the middle of Theatreland you’ll find Leicester Square. You can come here to watch a film in one of the cinemas, grab a meal in one of the restaurants, enjoy a drink in one of the many bars, or just to soak up the lively atmosphere. For a really intimate experience you should head for the Donmar Warehouse. This 250-seat theatre is renowned for award winning productions and will provide you with a truly memorable evening. The London Coliseum is another famous venue and is home to the English National Opera. If opera is your thing, or you would like to see if it is, this is the place for you to come and get an experience! 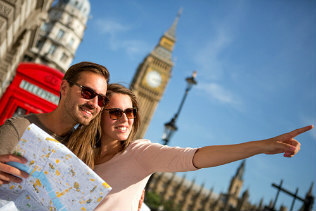 Trafalgar Square is located at the southern border of Theatreland and is full of attractions for you to explore. In Trafalgar Square you can view the artwork in the National Gallery and marvel at the impressive Nelson’s Column. One of the most famous Theatre duos is Rodgers and Hammerstein. Historically the place that has celebrated their works has been the famous Savoy Theatre. Currently you can go there to watch one of the couple’s most famous musicals, Carousel. At the northern border of Theatreland is the shopping haven of Oxford Street. Come here to spend your holiday money in the huge selection of shops and department stores that include the famous Selfridges. Soho is another really interesting area of London, slightly less mainstream than some of its neighbours but nonetheless interesting. Come here for a range of bars, clubs and restaurants, as well as getting an insight into Oriental culture in Chinatown. The London Palladium is amongst the most famous theatres in the country and is definitely among the most popular! Opened in 1910 the venue has staged some of the most famous productions in recent years, including The Sound of Music, and has also hosted the BAFTA Awards ceremonies. At the western edge of Theatreland you’ll find Piccadilly Circus. Piccadilly Circus is a hub of activity where you’ll find a huge selection of bars and restaurants, as well the shopping haven of Regent Street. Her Majesty’s Theatre was among an elite list of theatres built in the early 18th Century. If you really want the most dramatic and moving of performances you should definitely head for Her Majesty’s Theatre to see The Phantom of the Opera, which has been showing here since 1986! Underneath the Phoenix Theatre on Charing Cross Road is one of the most hidden of London’s hidden gems; the Phoenix Arts Club. This is a haunt for London’s entertainers, with an operatic design, intimate atmosphere and guaranteed good night.